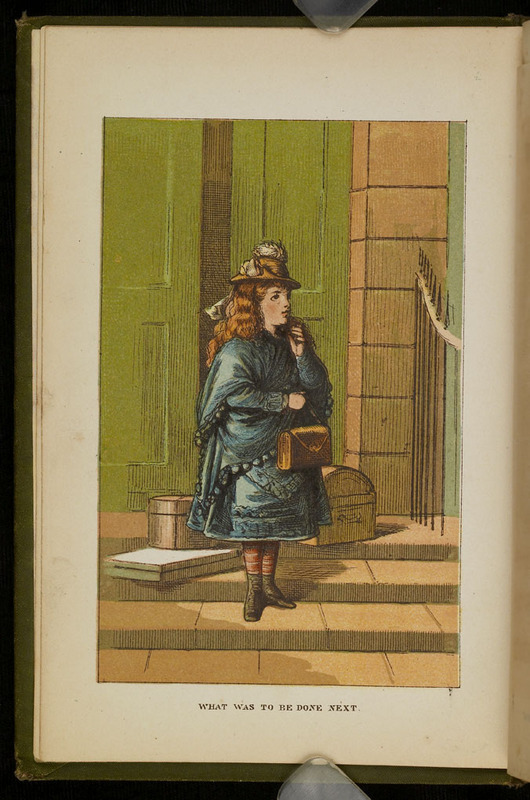 This full color frontispiece, appearing in the  Ward, Lock & Co, "Good Tone Library, Complete Edition" Reprint, depicts Ellen arriving at Thirlwall. 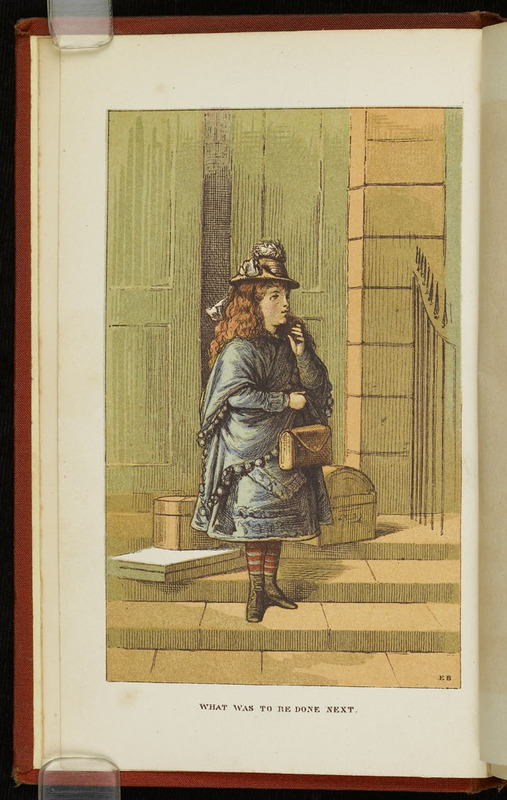 In the illustration, Ellen is standing on the steps before the door to the Thirlwall shop, and her luggage rests behind her on the top steps. She is wearing a blue dress and blue shawl, red and white stripped stockings, and a tan hat with white feathers on top. She is clutching her purse in one hand and her other hand is extending towards her face in a worried fashion. She is looking off to the right. An inscription below the illustration reads, "What was to be done next." This full color illustration appearing page 48a of the  Thomas Nelson & Sons, Ltd. Abridged Reprint, depicts John and George arriving at the Marshman's. In the illustration, George Marshman enters the door in a brown suit hold a small horn. John is behind him in a top hat and dark brown jacket. Ellen Chauncey is at forefront in a blue dress, white stockings, and black flats. Ellen is in a green dress standing beside George and touching his arm. Three other girls stand behind Ellen Chauncey, looking the men who arrived. 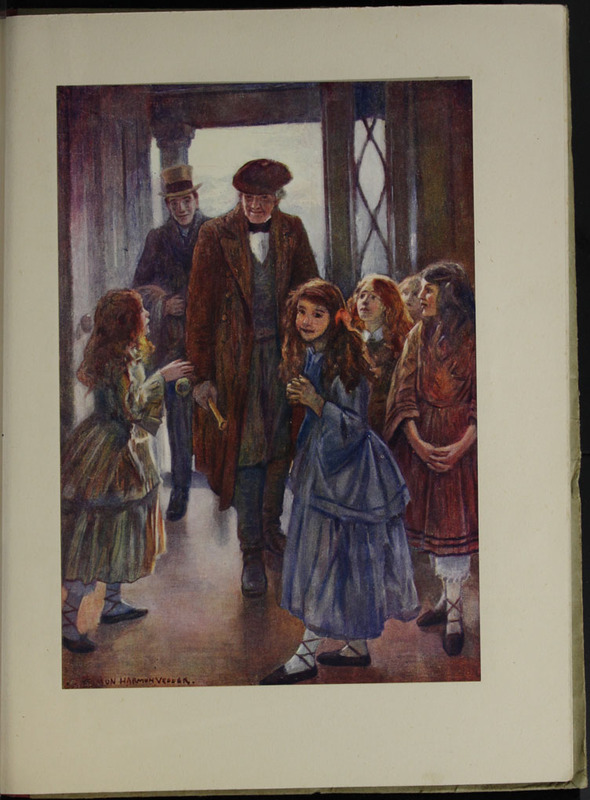 This full color frontispiece, appearing in the  Ward, Lock & Co. "Home Treasure Library, Complete Edition" reprint, depicts Ellen arriving at Thirlwall. 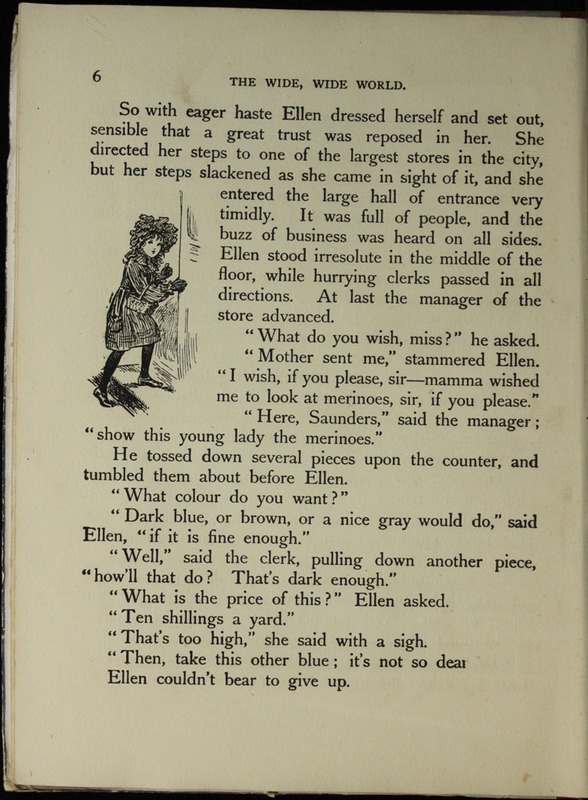 In the illustration, Ellen is standing on the steps before the door to the Thirlwall shop, and her luggage rests behind her on the top steps. She is wearing a blue dress and blue shawl, red and white stripped stockings, and a tan hat with white feathers on top. She is clutching her purse in one hand and her other hand is extending towards her face in a worried fashion. She is looking off to the right. An inscription below the illustration reads, "What was to be done next." 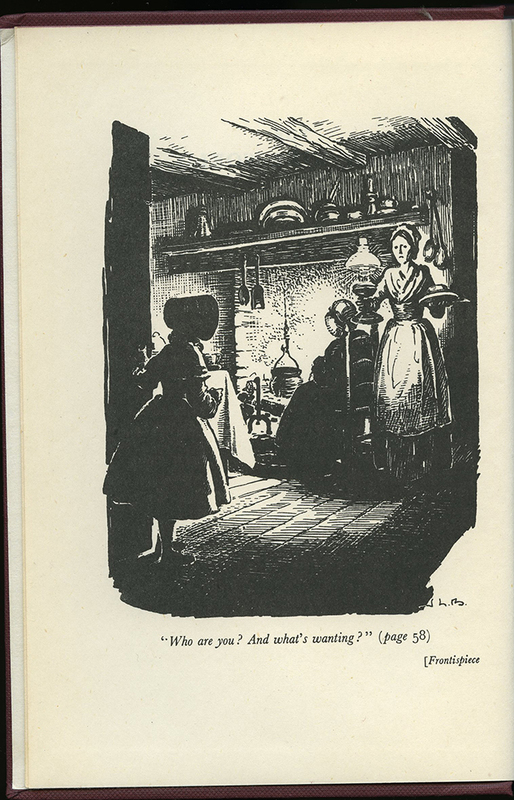 This black and white illustration, appearing as the frontispiece to the 1853 G. Routledge & Co. reprint, depicts Ellen left alone at the door of the village inn, the “Star” of Thirwall, to meet her aunt. The stagecoach that left Ellen there can be seen driving away, carrying the maid Timmins who had cared for Ellen on her journey. A stranger, later identified as Sam, looms behind Ellen, sweeping the porch of the inn. A number of chickens and ducks wander in the street around Ellen. 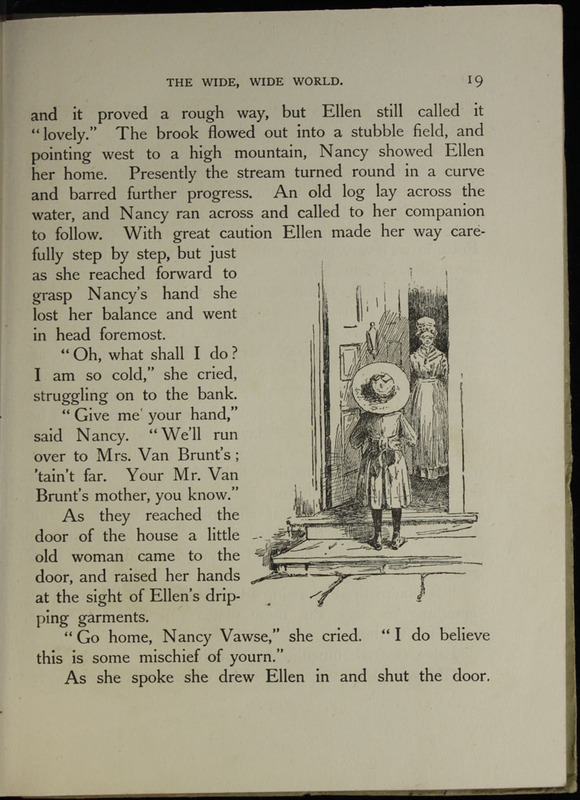 The caption below the illustration reads, "Ellen left at the door of the Village Inn," referencing the scene on page 81 of the novel, at the end of chapter VIII and the beginning of chapter IX. The name of the illustrator, Dalziel, is inscribed in the lower-right corner of the illustration. 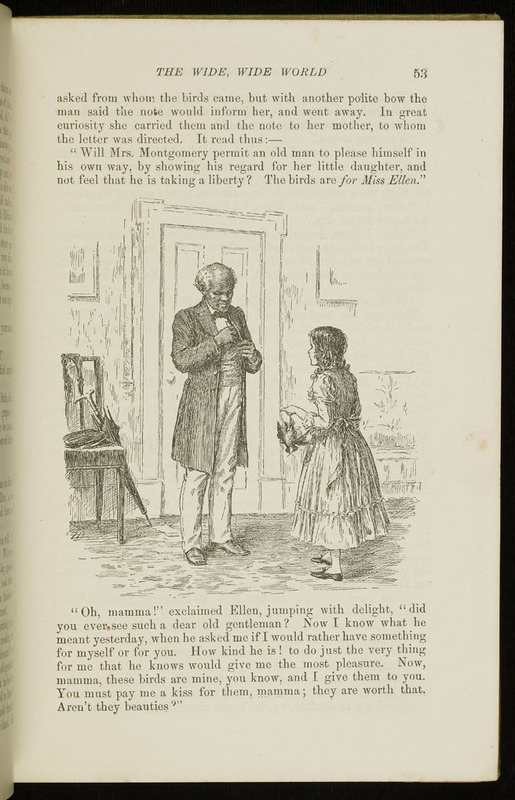 This illustration, appearing on page 222a of the  S.W. 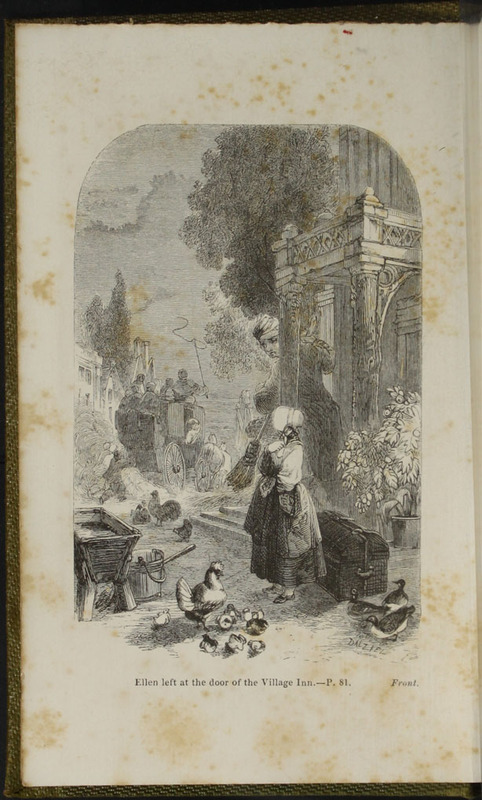 Partridge & Co., Ltd. edition, depicts Alice, Ellen, and John arriving at the Marshman's. 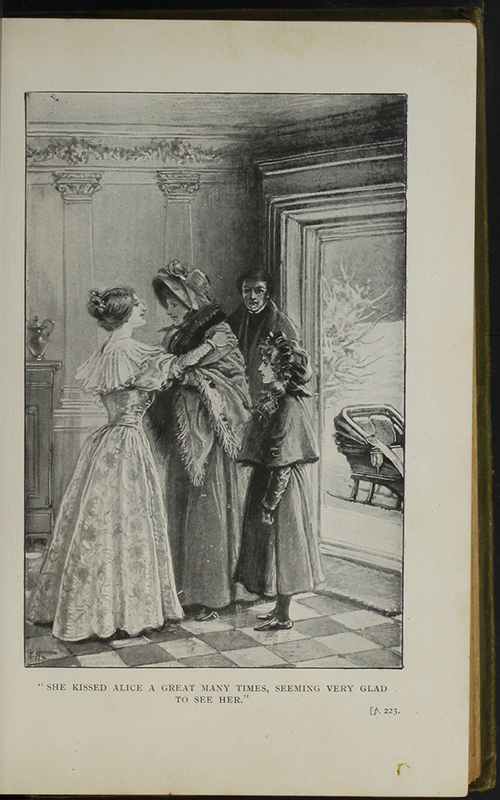 Alice, wrapped in a heavy shawl, is being greeted by Miss Sophia in a formal room while Ellen and John stand behind her, watching the encounter. Through the open door that Alice, Ellen, and John entered through, the back of a sleigh is visible as it sits surrounded by snow. The warmth of the encounter is contrasted with the winter weather outside the home. 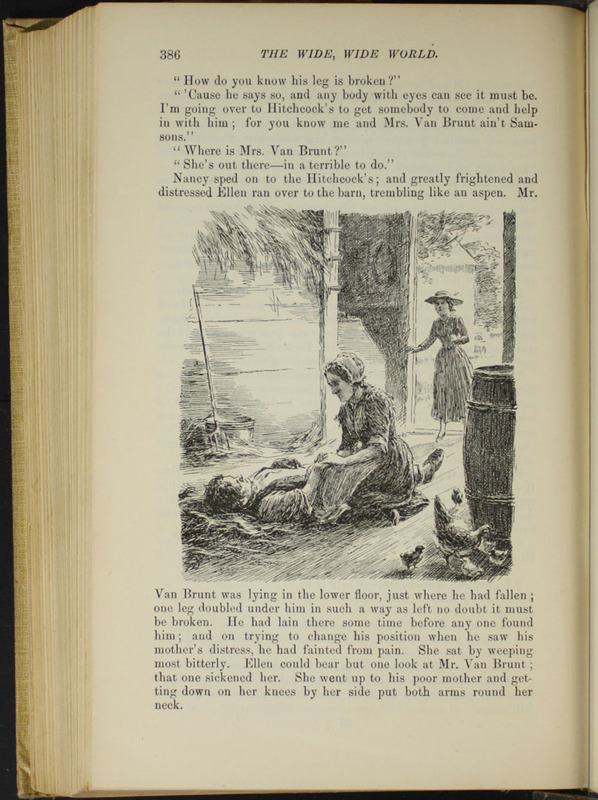 Below the illustration a caption quotes a sentence from page 223 and reads, "She kissed Alice a great many times, seeming very glad to see her."